One thing my sister and I share is an obsession for perfume. In another life, we could've been perfumists. And when it's Lady Gaga + Perfume, I am more then interested! 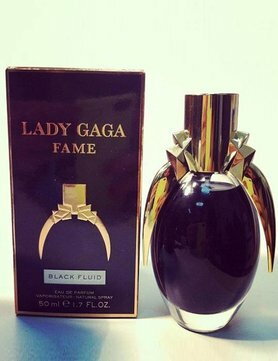 Lady Gaga has announced that she has recently finished producing her first fragrance wonderfully titled "Fame". The perfume took two years to produce from start to finish and is set to debut in the beginning of September 2012. The design of the bottle was recently leaked to fans worldwide when a fashion editor posted instagram pictures of the front and back. Lady Gaga was not amused and decided to take to her account to express her views. "Looks like photos of my perfume are being leaked. Oh you fashion editors I could just crinkle my hands at you!" The editor instantly took down the picture but since the design had been leaked, Lady Gaga decided to post it on her twitter feed. From the back of the bottle, we can see some intriguing ingredients such as tears of Belladonna, crushed heart of tiger orchidea, and a black veil of incense. What a way to stand out! She has even decided to create a trailer for the perfume to get ready for the launch. Check out the video below. Would you be stores grabbing this scent? I am curious as to how it'll smell!